The following game comes from Germany's prestigious 2001 Bad Wörishofen tournament. Zambia's Amon Simutowe entered this tournament after a decent showing at the Goodricke International in India. The young IM is in search of his final GM norm for the required three, but this tournament would be a stiff test with many seasoned GMs. 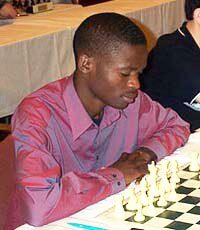 As it turned out, Simutowe scored an undefeated 7½-½, but he did not face an opposition strong enough for the norm. Nevertheless, he had a good tournament and closed on a high note by defeating German FM Jan Sprenger in a classic handling of the Sicilian. Kenny Solomon of South Africa came to the U.S. in the summer of 2001 to participate in two major tournaments. The first of those was the World Open, one of the world's strongest open tournaments. Kenny scored an impressive 6 points in his U.S. debut and impressed many with his tenacity and "will-to-win" attitude. 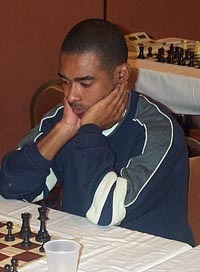 The second tournament was the Wilbert Paige Memorial where his nine games averaged 62 moves!! In this game, he allowed his opponent, Peter Gilruth, to clamp on his position like a vice, but was able to spring free and launch a counterattack. This game is annotated by Kenny himself and exhibits the spirit of a winner.